This factsheet tells you how to care for your feeding tube and stoma (the artificial opening into your stomach) and how to take your feed and medications via your tube. Your nurse or dietitian needs to fill in parts of this factsheet. A gastrostomy is an artificial opening through your abdomen into your stomach. A feeding tube is inserted through the opening so that special liquid food (feed), medications and fluids can go directly into your stomach. Some feeding tubes go down into your jejunum, a part of your small intestine. There are two types of gastrostomy tube, a PEG (percutaneous endoscopic gastrostomy) and a RIG (radiologically Inserted gastrostomy). These terms describe how the tube is fitted. A – Feeding port. B – Flange. C – Clamp. D – Balloon inflation-deflation port. There are two types of tube feeding, bolus feeding using a syringe, and pump feeding. Both types of feeding are described in the following sections. Your dietitian will decide which type of feeding is best for you. Your gastrostomy tube has centimetre (cm) markings. Always check that the flange (or bumper) on the tube is at the same cm marking before starting to tube feed. Your flange (bumper) is at _______________ cm. Close your feeding tube clamp, then open the cap at the end of your feeding tube (a RIG tube doesn't have a clamp). Remove the plunger from the syringe. Connect the syringe to your feeding tube. Hold the syringe upright and pour the prescribed amount of warm water into the syringe to flush the tube. Open the clamp on your feeding tube. Pour the prescribed amount of feed into the syringe. Allow the feed to flow into the feeding tube until it has gone. Close the clamp on your feeding tube. Pour the prescribed amount of warm water into the syringe to flush the tube. Open the clamp and flush the feeding tube. Close the clamp and disconnect the syringe. Close your feeding tube with the attached cap. If you have more than one medication, take each one separately. Flush your feeding tube with 10-15 mL of warm water between each medication. For the first one to two weeks after your tube is inserted, you can expect a small amount of discharge from your stoma as it heals. Clean your stoma daily with warm soapy water. If the discharge carries on, clean your stoma more regularly using the saline solution provided by the PEG nurse. After six weeks, you can swim or have a bath. Turn your feeding tube 360 degrees and move it slightly in and out of your stoma daily. This stops the tube from sticking. Attach your feeding tube to your stomach using the tube fastener supplied by the PEG Nursing Service. This will stop it moving in your stoma. If you gain or lose weight, you can reposition the flange (bumper) on the tube by sliding it up or down the feeding tube. It should always sit 1 to 2 mm away from your skin. 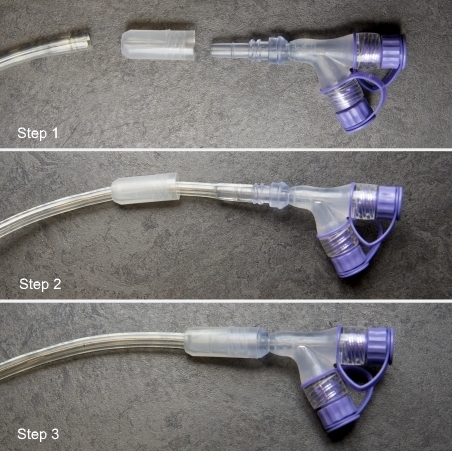 You can remove the feeding port at the end of your feeding tube to clean it or replace it. See the diagram for details of how to reattach the feeding port. If you haven't started using the tube for feeding, flush it with 60 mL of warm water twice daily. If the flange (bumper) is at the same cm marking but further away from your skin than normal, this may mean that the balloon has deflated. If this happens, try to push the tube back into its original position and tape it down. Contact the PEG Nursing Service urgently (see below). The PEG tube doesn't have a balloon. It has a flange inside your stomach that keeps your feeding tube in the right position. if you have a jejunal tube, the tube may be kinked or knotted, an X-ray will identify this. In this case, the tube may need to be replaced. redness or a raw area around your stoma. If your feeding tube comes out, your stoma will begin to close within two to three hours. Contact the PEG Nursing Service immediately (see below). You may need to go to the hospital to have it put back in. For extra supplies such as syringes and dressings, contact the PEG Nursing Service (see below). If the nurse isn't available to take your call, leave your name, address, phone number and what supplies you need on the answerphone. For giving sets, contact the PEG Nursing Service, your community dietitian or phone the Canterbury DHB Supply Department (see below). For urgent help after hours, for example, if your tube falls out, phone Christchurch Hospital on (03) 364-0640 and ask to speak with the Gastro Nurse on call. Written by Nutrition & Dietetics and PEG Nursing Service, Canterbury DHB. Adapted by HealthInfo clinical advisers. Page created July 2018. Bowers, S. (2000). All about tubes. Your guide to enteral feeding devices. Nursing 2000. 30, 12: 4147. O’Brien, B., Sarah, D. & Erwin-Toth, P. (1999). Gastrostomy tube site care: A practical guide. R. N. 62, 5. Rollins, H. (2000). Hypergranulation tissue at gastrostomy sites. Journal of Wound Care. 9, 3. Frang, J., Lynch, C. (2004). Prevention and Management of Complications of Percutaneous Endoscopic Gastrostomy (PEG) Tubes. Practical Gastroenterology, 66-75. Selan, M. (2012) A multidisciplinary approach to gastrostomy management. European Journal of Clinical Nutrition, 66, 1374. Doi: 10.1038/ejcn, 2012,144. Kurien, M., McAlindon, M., Westaby, D., Sanders, D., (2010). Percutaneous endoscopic gastrostomy (PEG) feeding. BMJ 2010; 340:c2414. Doi:10.1136/bmj.c2414. Loser, C., Aschl, G., Hebuterne, X., Mathus-Vliegen, E., Muscaritoli, M., Niv, Y., Rollins, H., Skelly, R., (2005). ESPEN guidelines on artificial enteral nutrition – Percutaneous endoscopic gastrostomy (PEG). Clinical Nutrition 24, 848-861. Doi:10.1016/j.cinu.2005.06.013.